This morning, an email from the new CEO of Citi Bike Jay Walder, landed in my inbox. 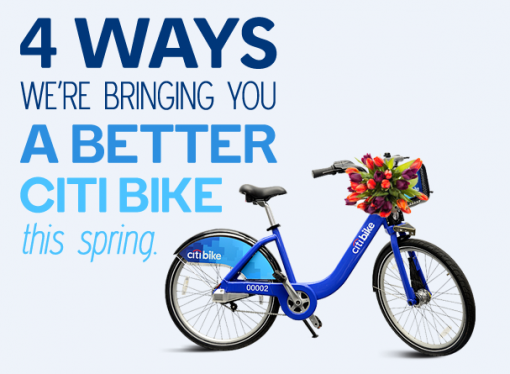 The email announced their plans on improving the Citi Bike service in 2015. I don’t have many complaints from my first year in the program. I love Citi Bike; it was a smooth ride save for one system glitch. That said, there could be a few things that could stand being updated, but I didn’t consider any of them urgent. If I were to complain about the system — it would be the availability of bikes (both renting and docking) in the East Village. Outside of that, I don’t have many issues with Citi Bike. I’ve always complained about bike share technology — not just New York’s. Hopefully the new technology will be much more intuitive. I wish the key dispenser existed when I signed up. I was miffed that after I applied and paid that I had to wait for my key to be distributed via snail mail. That was silly waiting 7-10 business days. Great. When the first phase of bikes got new seats, I never sat on any of the older bikes with their torn and weather worn seats. System expansion is being readied as we speak and will begin later this year. We’ll start in Bed-Stuy, Williamsburg and Greenpoint and Long Island City will host the first bikes in Queens. We are already working with the community to plan expansion for the Upper East and Upper West Side. And by 2017 we will bring Citi Bike to neighborhoods including Harlem, Red Hook, Astoria and beyond. I am excited for the improvements (and expansion) of the service I already love — even at the new $150 price point. No Valets: How to crowdsource Citi Bike’s supply and demand problem Is Citi Bike experiencing docking problems? Did you get the dreaded “Looks like you’ve had a Citi Bike out for a while…” email from Citi Bike?